Having a powerful password adds a lot of safety from the user’s perspective. But remembering a long list of long passwords is not gonna be an easy task. 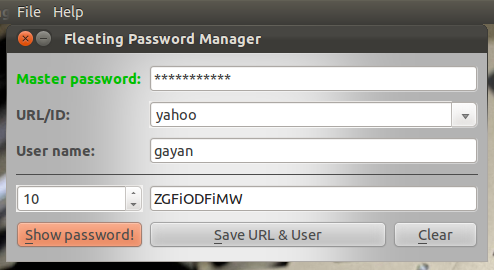 If you use Ubuntu, you can use a password manager such as Revelation or if you’re looking for a cross-platform tool then FPM2 is another one. If you want a command-line based one then try ‘makepasswd‘. I recently came across with this other tool called “Fleeting PM (password manager)” which uses a slightly different approach. It’s a simple password manager and a generator and based on a master password, URL and the login name it creates a secure password automatically. So as long as you remember those details, you can retrieve the password for that account. But it supports the more traditional approach of saving all the data into the disk and re-opening the later as well. *. Written in Qt, supports both GNU/Linux and MS Windows OS platforms. *. You can add the master password, URL or ID and the User name. You don’t have to type the whole URL. For instance if you’re trying to generate a secure password for your “http://www.Facebook.com” login, then you can fill the URL using something like “fb” or “facebook”. The same applies to the user name as well but it’s perhaps wiser to use the actual user name so you can remember it easily. *. Change the password length (default is 8 characters but for additional security, you can create a password with up to 32 characters). *. You can export and import the user accounts manually. *. 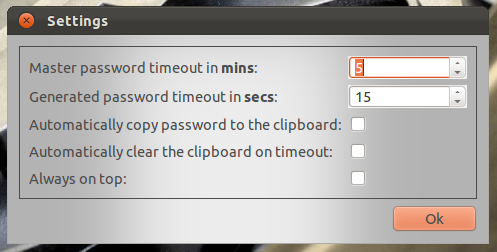 You can adjust some of other settings such as: Master password timeout, generated password timeout, copy the data to your clipboard (disabled by default for security reasons) and few others. You can install “FleetingPM” in Ubuntu 12.04 Precise Pangolin, 11.10 Oneiric Ocelot, 11.04 Natty Narwhal, 10.10 and 10.4 by simply typing the below commands in your Terminal window. Or you can visit this official FleetingPM page for more information (such as Windows installer files etc).